Public Health England publishes its annual flu report for the 2013 to 2014 season. 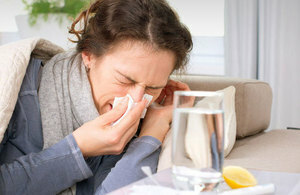 Low levels of influenza activity were seen in the community in the UK in 2013 to 2014, although a considerable number of influenza confirmed hospitalisations and Intensive Care Unit (ICU) admissions were reported, with a higher peak seen compared to 2012 to 2013, according to the Public Health England (PHE) annual flu report published today (12 June 2014). The 2013 to 2014 season was dominated by the flu A H1N1 2009 virus, with flu A H3N2 and very low levels of flu B also circulating. Although influenza activity overall was low, particularly in the elderly, admissions to hospital and intensive care were observed, with peak ICU and High Dependency Unit (HDU) numbers higher than seen during 2012 to 2013 and a similar total number reported. Throughout the flu season, 112 acute respiratory outbreaks in closed settings were reported across the UK with 2 distinct peaks. During the first peak of the season, the majority of outbreaks were reported from care homes mainly from typical winter respiratory viruses other than flu. In the second peak, there were an increasing number of outbreaks reported from hospitals predominantly resulting from flu A H1N1. Overall, 49% of outbreaks were from care home settings, with 39% in hospitals, 9% in schools and 3% in other settings. Flu vaccine uptake in those aged under 65 in a clinical at risk group was 52.3%, up from last season when 51.3% were vaccinated. Vaccine uptake in England for those aged over 65 years was 73.2%, similar to the 73.4% achieved last season. Uptake in all pregnant women in England reached 39.8%, down slightly on the 40.3% reported in 2012 to 2013, but considerably higher than the 27.4% achieved in 2011 to 2012. The uptake by frontline healthcare workers (reported by 99.3% of trusts) showed 54.8% were vaccinated, an increase over the 45.6% who were vaccinated in 2012 to 2013. As a first step in the extension of the programme, last year all children aged 2 and 3 years were offered flu vaccination. The level of uptake (42.6% in all 2 year olds and 39.5% in all 3 year olds) in the first year is considered encouraging and compares favourably with other vaccine introductions. Additionally, children aged between 4 and 11 years old were vaccinated in 7 pilot areas in England. Pilots for primary-school-aged children took place in Bury, Cumbria, Gateshead, Leicester City, East Leicestershire and Rutland, and the London Boroughs of Havering and Newham and South East Essex, with an overall uptake of 52.5%. This was a season of relatively low intensity of flu activity overall, however it’s worth noting that a spike in hospital admissions we saw during the flu season was actually higher than any single week the previous flu season. Vaccination ahead of the flu season is the best way to minimise the risk of serious illness or death, and it’s great that we’ve not only maintained strong vaccination rates amongst at-risk groups, but also successfully introduced the first step in the vaccination programme for children aged 2 to 16. Two novel respiratory viruses which emerged in 2012 to 2013, Middle East respiratory syndrome coronavirus (MERS-CoV) in the Middle East and avian-origin influenza A(H7N9) in Eastern China, have continued to result in human cases in 2013 to 2014, with none identified in the UK this winter. Surveillance and public health measures established in the UK for travellers from these regions returning with severe respiratory disease are on-going while the risk remains. The full Surveillance of influenza and other respiratory viruses in the United Kingdom: Winter 2013 to 2014 report is available for download. Vaccine uptake reports for 2013 to 2014 are also now available for download. The seasonal flu vaccination programme is based on independent expert advice from the Joint Committee on Vaccination and Immunisation (JCVI). The aim of the current flu vaccination policy is to reduce the serious morbidity and mortality due to flu by immunising those people most at risk of serious illness or death should they develop flu. This is in line with most other countries that have seasonal influenza vaccination programmes.